"Unexpected error from external database driver. Source:1101:40-107180004005.503.914"
Confirmed there was a Microsoft Security Update for Windows 7. Use XLSB (Excel Binary) or XLSX (Excel 2007) instead of XLS (Excel 2000). Go File > Save As in Excel and choose either XLSB or XLSX. 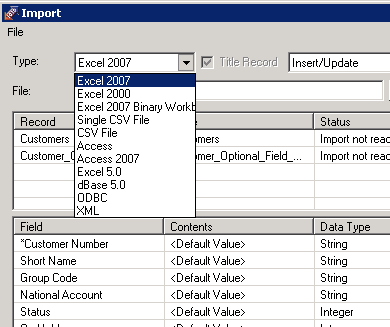 If file is changed to .xlxs or xlxb, use File Type 'Excel 2007' or Excel 2007 Binary on import. If you’re still having trouble or if you have questions about this and other Sage 300 errors, click below to leave us a note. A Sage 300 expert will follow up and help to get the problem solved.